Armed paramilitary policemen stand guard in front of the Guangzhou Railway Station after a knife attack, in Guangzhou, Guangdong province. The Chinese government’s strategy for fighting terrorism: permanent crisis management. The nature of terrorism in China is changing, as is the Chinese government’s response to the threat. Despite the importance of the issue for China and the world, there is little understanding in the West about the facts concerning terrorism in China. This is the third article in a four-part series dealing with the threat of terrorism in China – its origins and changing nature – as well as the central government’s response. See part one (“The Terrorist Threat in China”) and part two (“Beyond Doubt: The Changing Face of Terrorism in China”). China has responded to the rising threat of terrorism with the modernization of its security forces and increased surveillance of ethnic, political, and religious groups, as well as through developmental and legal initiatives such as the new anti-terrorism law. China’s anti-terror efforts have developed into preventive and permanent crisis management. In politics, anti-terrorism is currently a higher priority than it has ever been before. In August 2013, the State Council established the Leading Small Group on Counter-Terrorism (反恐怖工作领导小组), which is a top-level body in charge of advising and implementing counter-terrorism work, led by the minister of Public Security. Along with the establishment of the National Security Commission (中央国家安全委员会), which is headed by Xi Jinping himself, in January 2014, this has led to the centralization and prioritization of anti-terror policymaking at the highest level. Many changes since then have aimed to improve crisis response mechanisms, both through increased surveillance over groups seen as dangerous, specialized training for counter-terrorism troops, and streamlining the forces’ command chains. The paramilitary People’s Armed Police (PAP) has emerged as China’s most important asset in its fight against terror. The PAP’s troops are trained in the handling of ever more specific crisis scenarios, such as the liberation of hijacked vehicles and airplanes, the handling of explosives, riot control, and the management of hostage situations. 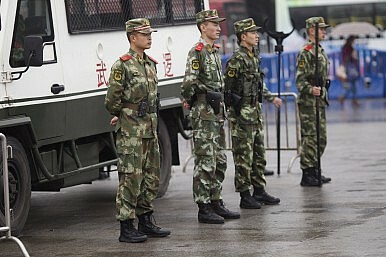 Counter-terrorism units of the PAP, the People’s Liberation Army, and the regular police force have been stationed in Xinjiang and other regions, and are permanently held on stand-by. Since then, more surveillance methods to control communication channels have been implemented to “maintain stability” (维稳). In late 2014, Minister Guo announced a new big data-based surveillance initiative, specifically targeting Uyghur activists and terrorist groups. Also, more than 30 million CCTV cameras are currently in use across the country, at least 40,000 of which are found in Xinjiang’s streets, public places, and in mosques. The “People’s War on Terror” also includes the mobilization of the population, including Uyghurs, to help the authorities hunt terrorists and to pass on information about suspects and alleged “terrorists.” Over the course of 2014, non-state media have reported increased surveillance of Muslim minorities all across the country, as well as arbitrary detentions and forced “repatriations” of Uyghurs living outside of Xinjiang. Chinese cities have also been reported as restricting cultural and religious practices, such as religious fasting, as well as wearing long beards and head scarfs. Hundreds of Uyghurs were detained and sentenced under suspicion of terrorism-related crimes. While many of the reported violent incidents in Xinjiang are unquestionably terrorist acts, some human rights groups and Uyghur activists accuse China of deliberately blurring the line between terrorism and local insurgencies in order to justify harsh security measures. Since both terror and political dissent are subject to strict media censorship, they may only be covered by state media — which usually releases very few details on incidents of either nature. In order to fight the perceived socio-economic roots of terrorism, China has launched a number of development initiatives. Beijing is trying to stabilize the Xinjiang Uyghur Autonomous Region by improving the living standards of Uyghurs, creating jobs and integrating Xinjiang with the Chinese economic heartland. These efforts intensified with the proclamation of China’s Silk Road Economic Belt initiative in 2013. While some of these efforts have shown positive results, others have been criticized as attempts to assimilate Uyghurs into the Han majority, or to eradicate local languages, cultural goods, or religious life. China is currently working on a new law that is to lay the legal basis for engaging terrorist threats and suspects and to create an operational legal definition of terrorism. The National People’s Congress published the first draft in November 2014 and a second formal round of deliberations on the law was held in February 2015. So far, the draft law condemns as terrorist acts “any speech or activity that, by means of violence, sabotage or threat, generates social panic, undermines public security, and menaces government departments or international organisations.” This very vague definition opens up the possibility for arbitrary applications and abuse. The fact that China is now turning to the task of creating a comprehensive anti-terrorism law reflects that a turning point has been reached: Terrorism has moved up the priority scale and Beijing sees a need to extend its instruments to tackle it. Coming Wednesday: The international aspect of China’s counter-terrorism. Johannes Buckow is a Research Associates at the Mercator Institute for China Studies (MERICS), Berlin. Marc Julienne is a Visiting Academic Fellow at MERICS and Moritz Rudolf is a Research Associate at MERICS. A closer look at the contents of China's first comprehensive anti-terrorism law.